In this part of Richmond Hill and/or Ozone Park, it is very common to see Guyanese or Caribbean style Chinese restaurants up and down Liberty Avenue and surrounding streets. None of them are particularly mind-blowing, but for my money, GT Rice Bowl takes first prize amongst them for food and atmosphere. Come during a big cricket match and find the place packed with beer guzzling fans. Come during an evening and the place resembles a club despite its modesty. Come for lunch and find a workaday West Indian eatery catering to locals. As a solo customer at midday, I got some stares from the groups of Coors Light drinking mothers at tables and individual men at the bar and felt slightly out of place. The woman running the show barely acknowledged me, not making it any easier, so I took a seat and tried to act like I was in my long time favorite restaurant. She just had a couple things on her mind or something though, because after bringing me a menu was very kind and donned a smile. Eventually I could see she was just annoyed with the men at the bar that were probably nursing their 4th or 5th beer at one in the afternoon. The menu here reads like a Chinese-Caribbean mashup, and it seemed only natural to order a rice dish since it is in the name. I went for the house special fried rice ($12.45, below) which turns out to be a mountain of food that should be able to fill two people. 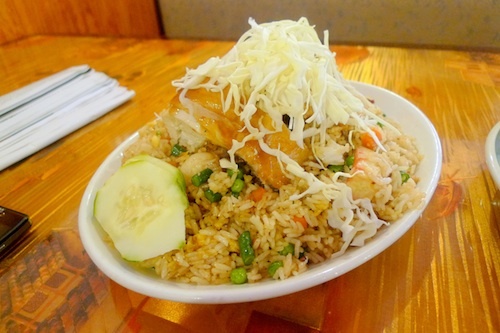 The rice mountain is generously proportioned with various chunks of pork, shrimp, and crab, and is all topped with a big slab of chicken that is moist and well-seasoned. The rice is not quite as greasy as your local Chinese takeout and is definitely more fun to eat. A few weak peppers are interspersed in the mix as well, but for real heat add the fiery sauce that is on offer on every table. Be careful with this stuff though! I have never been at night, but if you are in the area, I imagine that a group of four could settle in nicely to one of the booths with a bucket full of bottled beer and enjoy the "clubby" scene of it all. As with other places on this street, Coors Light seems to be the go to beer of the West Indian community, but they make plenty of cocktails as well. I'm so glad you are back! !